Regardless of whether it is a water level staff gauge, a plumb or a leachate measuring system, we can visualize every situation visually. This gives you as a customer a better view of the possible end result. In order to efficiently represent such facts, we work with the 3-D CAD system Autodesk Inventor. 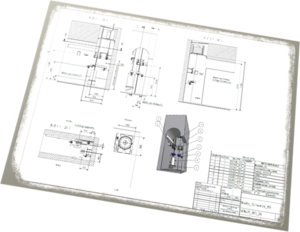 Our product designer hereby creates customized drawings according to customer requirements. Thus, as a customer, you have the opportunity to view the development processes and to identify potential errors or ambiguities, which can then be remedied early.